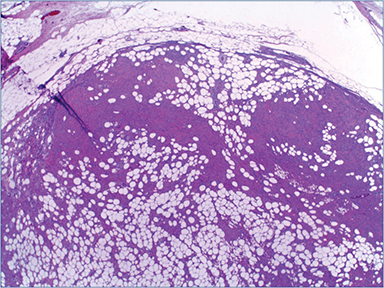 A 70-year-old woman presented with solitary round mass of right lateral breast. The patient underwent an ultrasound-guided core biopsy of this mass at an outside institution. The biopsy was originally misinterpreted as an invasive lobular carcinoma. She subsequently underwent excision of mass (lumpectomy) and sentinel node sampling. 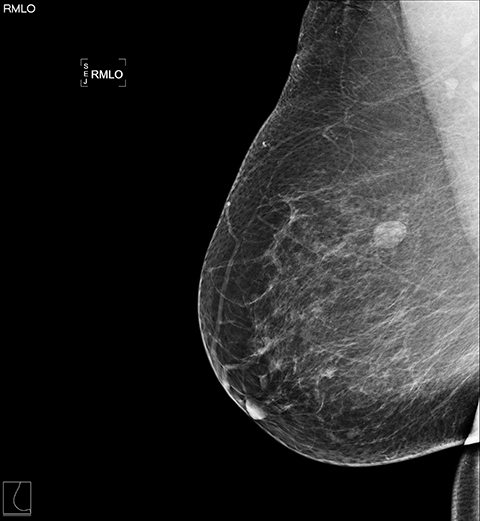 Standard mammographic views and diagnostic views of the right breast demonstrated heterogeneously dense breast tissue and a rounded mass in the lateral right breast (Figures 1A and 1B). 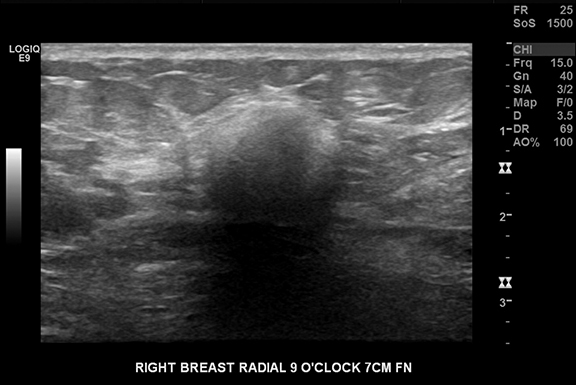 Focused ultrasound of the lateral breast demonstrated a circumscribed hypoechoic indistinct shadowing mass, measuring 13 × 13 × 12 mm (Figure 2). Because of these suspicious imaging features, biopsy was performed for histologic diagnosis with 5 tissue cores obtained. A biopsy-marking clip was placed. Pathologic evaluation of the ultrasound-guided core biopsy showed a nodular proliferation of uniform, bland ovoid to spindle-shaped cells separated by prominent adipose tissue and hyalinized collagen bundles, with no significant atypia or mitotic activity (Figure 3). Immunostains performed by the outside institution revealed that these cells were positive for estrogen (ER) and progesterone receptors (PgR), and were negative for E-cadherin. Excisional biopsy (lumpectomy) showed a similar appearing neoplasm (Figure 4), but this proliferation was very well circumscribed (as seen on initial imaging). Although the lipomatous component was prominent on the initial core biopsy, on excision this component comprised less than 50 percent of the lesion; the majority of the lesion displayed a predominance of spindled cells and hyalinized collagen bands. The two sentinel lymph nodes examined on routine hematoxylin and eosin and cytokeratin (AE1/AE3) immunostains were benign. Additional immunostains performed at our institution revealed negative staining of the lesional cells for wide spectrum cytokeratin (CK), CK OSCAR (Figure 5A), epithelial membrane antigen (EMA), S100, HMB-45, smooth muscle actin and positive staining for CD34, desmin (Figure 5 B), estrogen receptor (Figure 6), and BCL-2. 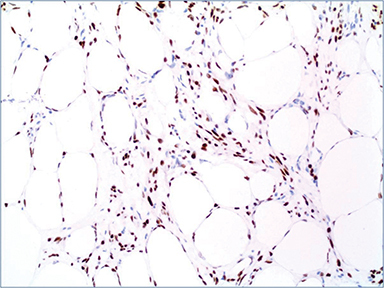 The overall histopathological and immunostaining patterns were interpreted as a myofibroblastoma with prominent adipocytic component. Needle core biopsy of MFB can be difficult to interpret based on small sampling, especially if one is faced with an unusual variant.3 In our case, although the lipomatous component did not ultimately fulfill the definition of “lipomatous myofibroblastoma” on excision, the presence of a significant adipose component intermixed with the plump spindled cells created the false impression of an infiltrating carcinoma. Moreover, the positive immunohistochemical stains for hormone receptors (ER and PgR) and absence of E-cadherin staining further reinforced the mistaken impression of invasive carcinoma.4 Thus, additional immunohistochemical staining and awareness of breast stromal lesions are essential in determining the correct diagnosis, along with close collaboration between radiologist and pathologist in correlating imaging with pathologic findings. Surgery is the recommended treatment for MFB since these lesions may recur if not entirely excised.9 Due to its circumscription with good cleavage planes; these tumors are usually easily excised. 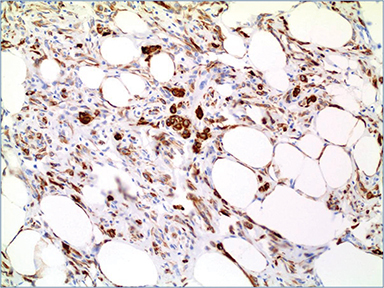 This case report highlights the diagnostic pitfall of mistaking myofibroblastoma for invasive lobular carcinoma in the setting of core biopsy with hormone receptor positivity. And it emphasizes the importance of radiologic-pathologic correlation in assuring a correct diagnosis, particularly when faced with a challenging radiologic and pathologic entity. Wargotz ES, Weiss SW, Norris HJ. Myofibroblastoma of breast: 16 cases of distinctive benign mesenchymal tumor. AJ Surg Pathol.1987; 11:493-502. Lerwill MF, Koener FC, Benign mesenchymal neoplasms. In: Hoda SA, Brogi E, Rosen’s breast pathology, 4th edition Philadelphia PA. WoltersKluwer. 2014:1019-1094. Magro G. Mammary fibroblastoma: A tumor with a wide morphologic spectrum. Arch Pathol lab Med. 2008;132(11):1813-1820. Magro G. Epithelioid-cell myofibroblastoma of the breast: Expanding the morphologic spectrum. Am J Surg. Pathol. 2009;33(7): 1085-1092. 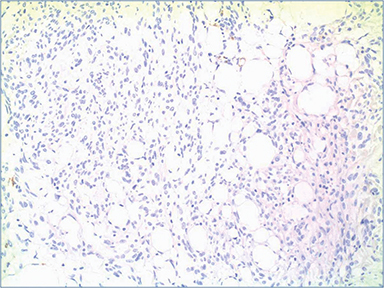 Wahbah MM, Gilcrease MZ, Wu Y. Lipomatous variant of Myofibroblastoma with epithelioid features: a rare and diagnostically challenging breast lesion. Ann Diagn Pathol. 2011;15(6):454-458. 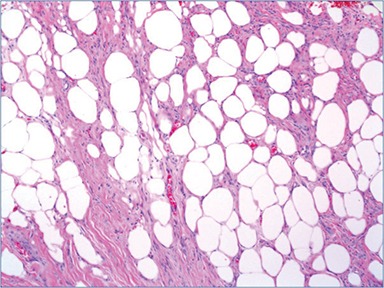 Magro G, Michal M, Vasquez E, Bisceglia M. Lipomatous myofibroblastoma: a potential diagnostic pitfall in the spectrum of the spindle cell lesions of the breast. Virchow’s Arch. 2000; 437(5):540-544. Dockery WD, Singh HR, Wilentz RE. Myofibroblastoma of the male breast: imaging appearance and ultrasound-guided core biopsy diagnosis. Breast J. 2001;7(3):192-194. 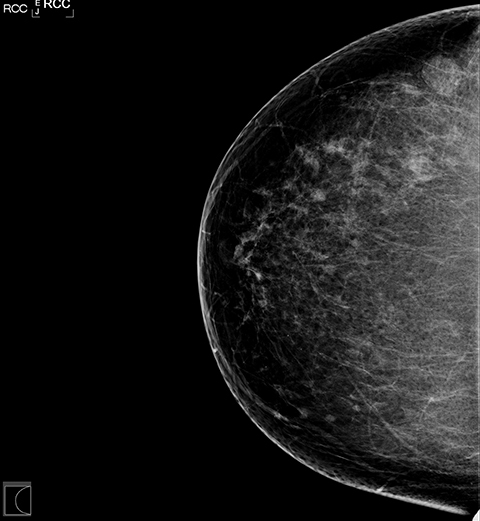 Greenberg JS, Kaplan SS, Grady C. Myofibroblastoma of the breast in women: imaging appearances. AJR Am J Roentgenol. 1998;171(1):71-72. Mele M, Jensen V, Wronecki A, Lelkaitis G. Myofibroblastoma of the breast. Case report and literature review. Int J Surg Case Rep. 2011; 2(6):93-96. Raut P, Lillemoe TJ, Carlson A. Myofibroblastoma of the breast. Appl Radiol. 2017;46(3):42-44. Prepared by Dr. Raut while a Surgical Pathology Fellow at the University of Minnesota in Minneapolis; Dr. Lillemoe while serving at Hospital Pathology Associates and Allina Health Laboratories in Minneapolis; and Dr. Carlson while in the Department of Radiology at St. Croix Regional Medical Center in St. Croix Falls, WI.